Each TerraCuddle represents an individual character trait. And, each TerraCuddle has its own CharacTerra stories. The moral, or TerraTruth, of each story provides an interesting and fun way to help all of us bring out the best in ourselves - because it's what's inside that counts! TerraCuddles are cute, fun-loving little angels who watch over you, who can deliver inspiration when you need it most..and more! TerraCuddles are here to help make the earth a better place. These cute little characters not only make things look a little nicer, their messages deliver inspirational thoughts that can help all of us feel a little nicer inside. The original TerraCuddle products were attractively gift-boxed and came complete with their own CharacTerra StoryBook and decorative Display Stand inside! 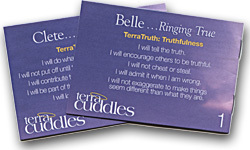 Within each StoryBook fable is a Secret CuddleCode to unlock special sections of this web site. Just click on each TerraCuddle's Treasure Chest to reveal special pages filled with CharacTerra activities, inspiration and hidden CuddlesClub treasures! 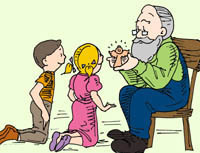 Each CharacTerra StoryBook is a fable told by Grandpa Clay in which a dilemma develops that is happily resolved by applying each TerraCuddle's TerraTruth. Within each story is a set of "I Will" statements that help drive home each character trait.